For drivers who want to get behind the wheel of a vehicle that offers all of the latest audio and technological features, there are few options better than the new Volvo XC90. Indeed, a brief glance at its list of gadgets will quickly reveal why this luxury SUV is one of the most popular vehicles in its class. 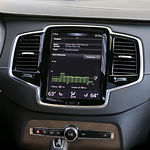 The Volvo Cars of Evansville team has simply fallen in love with the XC90's 12.3-inch digital display. This feature displays important information such as navigation details, road signage, and telephone info in a way that is easy for the driver to see. Even better, the system can adapt to learn your preferences - so it always displays the information that you most need to know. Music lovers will, of course, be drawn to the XC90's Bowers & Wilkins premium sound system. Featuring 15 speakers and a 1100W output, this feature turns this SUV into the perfect place to listen to your favorite tunes.